Der Tank is a sponsor for Schilling, a small indie music festival held in Kilingi Nõmme, Estonia. Instead of exposing our logo with all other sponsors either on printed materials or in front of the stage, we invited our employees, clients and partners to the event as a thank you for a great year. There, we put up an installation as a targeted advertisement. 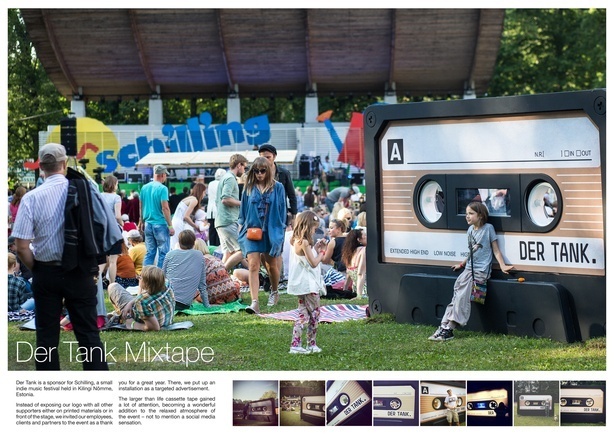 The larger than life cassette tape gained a lot of attention and became a wonderful addition to the relaxed atmosphere of the event.